The trouble with trivia-packed presentations on the state of the world is that the trivia has changed by the time it is presented to a mass market. Add to that the possibility that much of the trivia was never accurate in the first place. 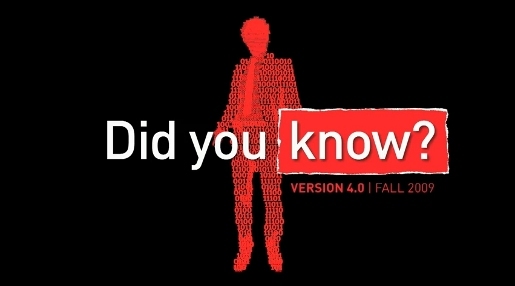 That’s the dilemma addressed in two versions of “Did You Know 4.0”, released online in 2009 in response to “Shift Happens, Did You Know?”, a presentation developed by Karl Fisch, Scott McLeod and Jeff Brenman in 2007. Back in 2007 Karl Fisch presented an eight minute PowerPoint presentation for staff development at Arapahoe High School in Centennial, Colorado. Fisch used content from David Warlick, Thomas Friedman, Ian Jukes and Ray Kurzweil, tying it together with music from Last of The Mohicans. Scott McLeod adapted the presentation by removing many of the school-specific slides (shortening it to 6 minutes 5 seconds) and reformatting it in a number of formats, including Quicktime, WMV, streaming flash movie, downloadable flash movie, AVI video, YouTube (as above) and PowerPoint with mp3 audio file. See the Shift Happens short film and transcript on my Postkiwi blog. This completely new Fall 2009 version, designed by XPLANE, includes facts and stats focusing on the changing media landscape, including convergence and technology, and was developed in partnership with The Economist. The video encourages viewers to visit mediaconvergence.economist.com and shifthappens.wikispaces.com. Music is “Home Tonight”, by DoKashiteru. 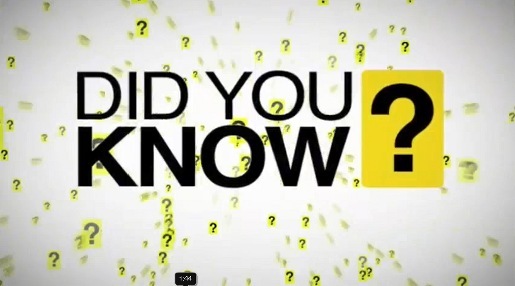 Brothers Darren Bachynski and Jared Bachynski have produced their own update on “Did You Know?”, titled “4.0 for 2009 Globalization & Our Changing Planet”. The key to watching this version is to keep going right to the end. Once you’ve read the final sentence, everything falls into perspective.